From a very good discussion on my forum. The full discussion can be found here. You all know me, I am constantly looking for the very best information that I can find to pass onto my students. Many of you have watched as I worked through my varying obsessions from CQB, to Low Light, to Point Shooting, to Dynamic Movement, to the Reactive Gunfight, to Perfecting the Fundamentals of the Proactive Handgun, and now to my very public announcement to get deep into Perfecting the Fundamentals of Fighting with a Rifle. I wanted to write this article to begin the discussion on my experiences training with ninpo_student and in return, then passing that knowledge onto my students. As an Instructor, every once in a while you come across something that is an absolute game changer. For those of you that trained with ninpo_ student in April of 2016, you probably know what I am talking about…….Recoil Control and the Consistent Recovery from Recoil. For me, what was so cool about the class is how everything ninpo_student was teaching in regards to this subject was in perfect alignment to what I was doing inside of my proactive handgun courses. While the techniques were different, the concept was virtually identical……get structure behind the weapon and mitigate the recoil as much as possible, in order to get faster and more accurate hits. Inside the course in April, ninpo_student said something that has stayed with me from the very first moment he said it. At that point he showed us what they had learned to do to be as fast and accurate as possible, inside of typical CQB distances. Make no mistake about it, the best defense is not a good offense……the best defense is an outstanding offense! I wanted to write this article to begin to discuss owning an outstanding offense in regards to gunfighting with a carbine. This material comes from the best Gunfighters in the world, who learned hard earned lessons as their brothers died around them while fighting the Global War on Terror. Ninpo_student passes on these lessons to honor his brothers and I would hope to be seen as doing the same. If there is one thing that I have learned over the last couple of years, it’s that we have ALL been taught a huge amount of theory. These theories cannot be tested by one gunfight, or two, or five, or ten, or twenty five. For theories to be adequately tested, it require a significant number of gunfights. What do I consider significant………. somewhere around a hundred gunfights. Until then it is simply theory! America has been at war since 2001, this is the longest time period that we have ever been at war. The amount of experience and knowledge coming out of this time period is simply unsurpassed in American history. If you are not paying attention to the lessons learned, the myths dispelled, and the theories blown out of the water you are missing out on some amazing information. With all of that said……..what do we need to do to be as fast and accurate with a rifle as we can possibly be? When you are blasting long held beliefs out of the water and talking about the failures of past theories, I find it is best to set the stage and first begin discussing the thinking behind those theories. Almost immediately, you begin to see the problem with the past thinking. When I started discussing the “locked wrist grip” on the handgun, the new habits are such a dramatic change, that there needed to be some convincing to get people behind putting in the substantial work needed to make those changes. This stable rifle shooting platform is going to very much be like that. The changes are dramatic. There will be a resistance to the changes. The convincing is easy with the rifle in your hand, the evidence of the tracking of the sights in your face, and the absolute truths of the hits on the target. It is not going to be near as easy in the written form. Lay down the science and people with good common sense will see it plain as day. On the structure behind the rifle we need to understand the learning progression that we went through. The M4 set up and the techniques used came to us straight from the use of the MP5. Standing straight up, mount of the rifle in the shoulder pocket, collapsed stock, and a mag well hold. The problem is that the 5.56 is not a handgun round. The theory behind the M4 and the techniques used simply did not facilitate a good recoil control or a consistent recovery from recoil. What worked well for the MP5 simply did not work well with an M4. When the urgency is high, there is no way to put the hits on board as they would need to be, in order to dominate the adversary with ballistic effect. When we are talking about taking down a religious zealot, who is not afraid to die, and only wants to take as many Americans with him as he can, an extremely dominant offense is an absolute must. And that dominate offense starts with recoil control and consistent recover from recoil, which of course is all about structure behind the gun. You can either store/absorb the energy or you can transfer/redirect the energy. Shooting a M4 like it was a MP5 has you absorbing the energy. You can only successfully absorb so much energy before it negative effects your ability to make fast and accurate hits. You get muzzle flip that climbs and you get knocked back on your heels. Absorbing does not work well. Transferring the energy through your body, and straight to the ground, through a straight rear leg is far superior to absorbing it. So, it is the stance that allows this transference of energy. Aggressive forward lean (and I mean AGGRESSIVE) with the support side foot forward and knee bent right above the foot. Firing side leg rearward, well back, and straight. You will look like you are trying to push a truck up a hill. The straight rear leg is essential. Without it, you are not transferring the energy to the ground, you are absorbing the energy. For those that have trained with me, the straight rear leg is going to be very different from what you are used to. It will take work, effort, and constant monitoring. This ain’t no combat crouch. Now that we are transferring the energy to the ground, we need to get as much body mass behind this rifle as we can. We may be transferring the energy, but it still has to go through the body. It needs to go through a body with solid structure. Hips squared up to the target! No blading! Rifle mount NOT high in the shoulder pocket with the toe of the stock. Mount it lower and inward of the shoulder pocket, somewhere in between the shoulder pocket and the center line. You will need to drop the head to get your cheek weld. The firing grip is all about working the trigger. Do not be too concerned about the trigger finger placement on the face of the trigger. More and more, accomplished gunfighters are beginning to just “bury” the trigger finger, just as we are seeing in the locked wrist grip on the handgun. The support grip is far forward in a C clamp, with the thumb over the top of the rail, and while pulling the carbine back into the mount. Do not overly pronate the C clamp, because when you are fighting for blood you are going to need to find a C clamp that you can do for hours and overly pronating makes that impossible. Extend well, short of full extension, find something that gets the job done with out unnecessary tension or strain. The C clamp is all about not allowing the muzzle to rise. The “pulling the carbine back into the mount” of the support hand also reduces muzzle rise and helps facilitate the recoil straight to the rear and straight to the rear only. With a M4 variant, with a short fore end, where you can not extend out to a good C clamp, gain the length that you need by extending the stock to it’s full length. This optimal stable shooting platform is all about not allowing muzzle rise (just like with a handgun.) Read your sights! If they are tracking upward, you have not nailed your optimal position. 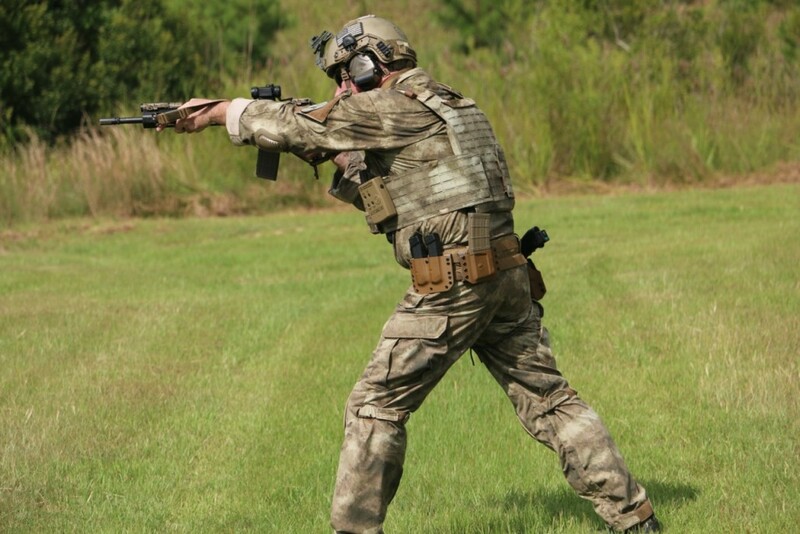 The ultimate goal is to have the rifle recoil straight to the rear……and straight to the rear only. If the muzzle never comes off of the targeting area, you can press the trigger as fast as you can and keep everything in a very tight pattern. This is a decent image of the aggressive forward lean, the squared up hips, and the straight rear leg. The C clamp may be slightly overly pronated and past that of being able to do for a long period of time. The overall concept is well displayed, but as in anything, this is going to be user dependent. Slight adjustments may be required, but the concept is sound in this image. If you have any questions feel free to join in on the discussion at my forum.